You can't see climate change in action, much to the disappointment of photographers and magazine art directors. Warming is a function of time, and we see it only as time passes. Years go by, we add more carbon dioxide to the atmosphere, temperatures rise, glaciers retreat and deserts expand. One of the essential facts about climate science is that unlike, say, weather forecasting, the farther ahead we look into the future, the more confident we can be of our predictions. So we know that burning enough fossil fuel to raise the concentration of CO2 in the atmosphere to 550 parts per million  twice preindustrial levels  will virtually guarantee a temperature increase of at least 3� F, with all the consequences that will carry. By contrast, we can't look at a hurricane, or at an iceberg melting, and say, "Yes, this is global warming, and we did this." Climate change is change, and change happens over time. In some places of the world, that change is happening more quickly than in others, so quickly that our "fast-thinking human mind," as the University of Copenhagen geologist Minik Rosing says, can almost catch it. One of those places is the coastal town of Ilulissat, the last stop on our climate tour of Greenland. It's home to the Ilulissat ice fjord, a basin-shaped wound in the rocky coast, through which the massive Sermeq Kujalleq glacier churns toward the sea. As the glacier moves  at the hardly glacial speed of over 100 ft. a day  the ice melts and cracks into cathedrals of blue and white that bob in the harbor beyond the isfledsbanken, or iceberg bank. Sermeq Kujalleq, which is fed by the 1.8 million cubic miles of solid ice that cover central Greenland, is the most productive glacier on the island, calving icebergs with dramatic regularity. The iceberg that sank the Titanic may well have come from Sermeq, and looking upon Ilulissat's harbor, choked with sheer cliffs of ice that dwarf even the stately cruise liners, I can believe it. We take a boat out for a tour amid the ice. In the Arctic summer Ilulissat is cool but not cold, maybe 65� F, but as we near the ice fjord, the temperature drops, as if cold is emanating from the icebergs themselves. As we leave the port, at first we encounter a slurry of ice in the water, which is sapphire blue because of the cold. But soon we near the giants, and they are easily over 100 ft. tall  and that's just above the water. (More than 80% of an iceberg's mass is beneath the surface, and the water in Ilulissat's port is more than a mile deep.) We can't get too close to the big icebergs  as they melt all the time in the salty sea, without warning, they can crack and cave in, loosing waves big enough to topple or even crush small boats. But even from a distance, they are breathtaking: natural cathedrals of white, lined by unmappable crevices, leaking pure glacial meltwater that pours into the sea as if from a fountain. It's easy to see why UNESCO made Ilulissat a World Heritage site and why tourist numbers have been growing steadily. But we're not here as tourists. After the boat docks, our group boards a helicopter piloted by a sprite of a Greenlandic woman for a tour of the fjord and glacier, which is retreating fast. Before we leave, we are shown a map of the glacier. 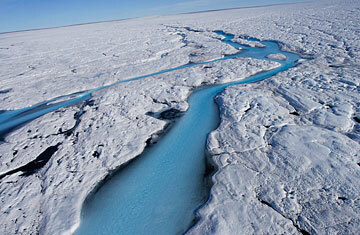 As pressure from the central ice cap builds up behind the glacier, it pushes its way to the sea through the ice fjord. The glacier ends where melting causes icebergs to calve off, and we see that each year the glacier has retreated farther and farther away from the sea. Sermeq Kujalleq is shrinking so fast (on a geological scale) that we can almost see it. This is global warming  as close as we can get to it  in action. There's no doubt here, no room for skeptics: temperatures have warmed in Greenland, and as they have warmed, the ice has melted. It is as simple as that. The helicopter dances over the ice fjord toward the tongue of the glacier, the spot where it begins to shard off. The icebergs here are still floating, but save for puddles of melt, you can't see the water; the ice itself is packed as tightly as commuters on a Tokyo subway car. Seen from the helicopter, the ice is dusted black and brown with the remnants of soil and rock the glacier scraped away on its trip to the sea. The ice fjord is bordered by tall walls of rock that rise on either side of the ice floe, carved, like much else in Greenland, by the glaciers. We land on one flat ridge for a closer look, 35 km from the tongue of the glacier. (You can't land on the unstable glacier itself.) We can just see the glacier on the horizon. It looks immobile and invulnerable, but we know it is vanishing. Kim Kielsen, the Greenlandic minister for the environment, who is traveling with the group, tells us he visited this same spot in 1992 and could see the glacier before him. "Now," he says, "gone." It's easy to misunderstand all of this. Climate change itself isn't a bad thing; it isn't even unusual. Take a geologic step back, and you can see that our climate has always changed, alternating just within the past several hundred thousand years between ice ages, when glaciers covered much of the Northern Hemisphere, to eras warmer than our own. Change is the nature of the planet, just as every winter and summer Sermeq Kujalleq advanced and retreated, long before we were here to give the greenhouse effect an added push. Our own human period has been one of unusual climatic stability  a fact that has been essential to our own species' success. What matters is not that change is happening but that it is happening so fast. In Ilulissat, the ice that once covered much of the sea in the winter and allowed hunting, fishing and travel by dogsled comes no longer. In less than a human lifetime  barely the blink of an eye in geologic time  a way of life millenniums old will be lost here. Elsewhere we may see temperate and fertile areas turn dry and barren in the same time period. What we've known and lived with may no longer exist  and we may not be able to adapt in time for what is coming. Change is painful, even if we can't see it happening. And then, looking over the ice fjord, we do see it. A stadium-size iceberg gives way, shattering first and crumbling like a collapsing skyscraper. The sound is of deep artillery fire, thundering between the walls of the ice fjord. It is spectacular, this sudden death and the energy released. I simply watch, entranced. I don't think of the conditions that led to its breaking or when its own tipping point was passed. I don't wonder whether we did this. As the helicopter flies back to Ilulissat, we pass by the remnant of the decimated iceberg. The carving away of the eroded, melting surface ice has revealed its pure, crystalline, blue heart, what remains. It is beautiful.